In 1933, Pauling had to show Warren Weaver and the Rockefeller Foundation board that he could do something important in the field of biological molecules, and he had to do it quickly. He had a single year before his research grant ran out. So he focused his attention on a protein target that promised fast results: hemoglobin, the stuff that makes blood red. Hemoglobin was an attractive research subject for several reasons. It was easy to harvest and purify; it contained iron atoms, unusual for proteins, which might offer new experimental approaches; and it could be crystallized without too much trouble. Anything that could be crystallized offered the possibility of study with x-ray crystallography, Pauling's specialty. He started working on several fronts simultaneously. He tried x-ray diffraction on a subunit of the hemoglobin molecule called porphyrin, but quickly discovered that good results would take years of work, not months. He turned to theoretical approaches, publishing a novel idea about how oxygen bound to hemoglobin, a concept that was later proved wrong but which excited discussion among other researchers at the time. Then time started to run out. He had other ideas, too, he told Weaver, very promising ideas for future research. Proteins were going to take time, he argued while angling for an extension on his one-year grant. Weaver and the Rockefeller board agreed. They gave him three added years of support at the munificent (for Depression times) level of ten thousand dollars per year. The money allowed Pauling to explore other approaches. He spent much of the summer of 1935 at a Caltech marine research facility at Corona del Mar, working with hemocyanin, a molecular relative of hemoglobin, which he isolated from the blue blood of keyhole limpets. He came up with a clever way of working with the iron in hemoglobin by suspending a small glass tube filled with cow's blood between the poles of a magnet, and measuring how its magnetic properties changed when the blood was oxygenated. He began to discover new things about how oxygen bound to blood. His new work resulted in the publication of three well-received papers in 1936. Perhaps he would make something happen in the world of biological molecules after all. See Also: Letter from Linus Pauling to Warren Weaver. September 25, 1934. See Also: Letter from Warren Weaver to Linus Pauling. November 23, 1934. See Also: Letter from Linus Pauling to Warren Weaver. November 26, 1934. See Also: Letter from Warren Weaver to Linus Pauling. December 27, 1934. See Also: Letter from Linus Pauling to Warren Weaver. January 25, 1935. See Also: Notes re: projects likely to be funded by the Rockefeller Foundation. March 6, 1936. Pastel drawing of normal Hemoglobin cells, 1964. 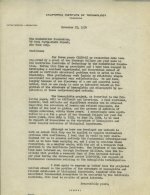 Letter from Linus Pauling to the Rockefeller Foundation. November 22, 1934.